The column which is designated as the transaction description field is used by PostTrans to detect the end of the transaction1. So therefore it is one of the most important fields on the transaction template. Effectively when the user presses the [Post Transaction] button, PostTrans scans down from row 20 until it finds the last description in the sheet. If you require PostTrans to skip cells which do not contain a description, you can put “.” which informs PostTrans to skip the cell, or special tags PostBlankDescription or SkipLine. In this above example we have used the tag “SkipLine” in cell G18 to force PostTrans to skip row 22. Forcing PostTrans to ignore the heading in this row. In cell C25 we have entered a “.” causing PostTrans to ignore this row also. To post blank description line use the tag PostBlankDescription or enter "#BLANK" or "-" in the cell, this can be the result of a formula. We can easily use a hidden column in a PostTrans template which is designated as the description field, and contains a formula to make such a decision. But the user enters the actual data in a separate column which is referenced by the hidden formula. What Description actually gets posted? The description that actually gets posted to Exchequer depends on several factors. Any text entered within the cell will be imported, and automatically word wrapped at 55 characters. The Stock item description will be pulled from the stock item in Exchequer and any text entered in the PostTrans template will be ignored. Any following rows in the template, with no stock code, quantity or value will be associated with the stock item above. It is therefore possible to post a stock item into a transaction with over six lines of description very easily. if “and break stock desk, two new line, on ’,’” is turned on any "," in the description, will cause new line to be posted. In version V7.3.20 the "," can be changed to any char such as "|"
We also have "Ignore 0 qty/hours transactions and zero values and NOM’s" turned off, else the llines with no qty will be ignored. It’s important to note there are issues with this transaction. 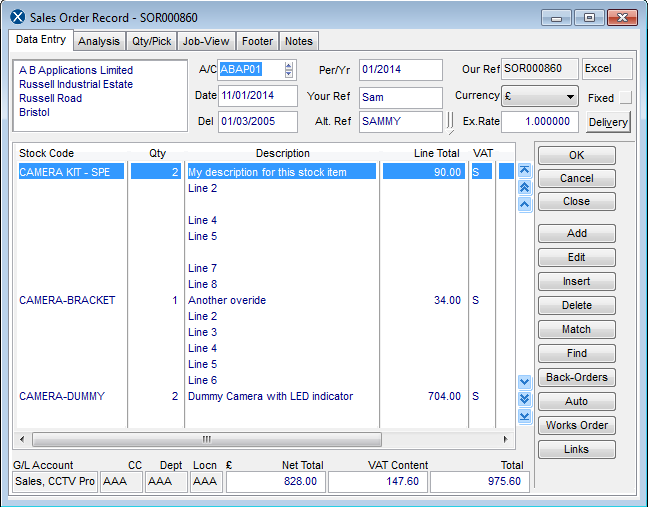 We have managed to import stock items with over six lines into the SOR. When the transaction is picked we may find Exchequer will only copy over the first six lines of each of those stock items onto the delivery note and sales invoice. 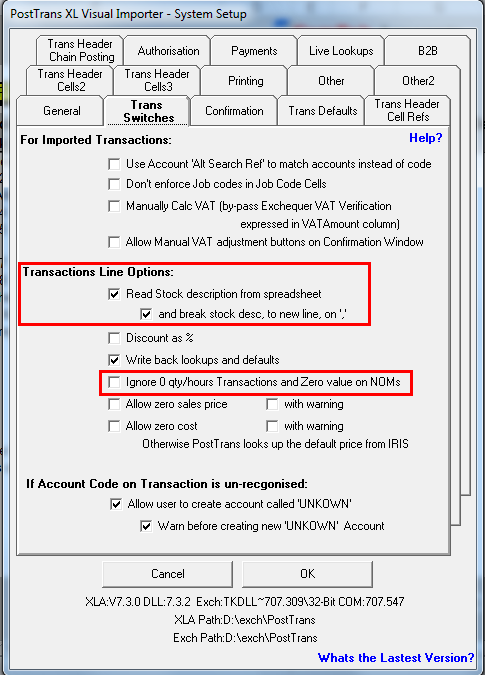 1 When posting Serial/Batch/Bins the stock code column is used as the end of transaction marker.